It’s not unheard of for board game companies to venture into the foray of digital games. Academy Games, a board game company with a small but impressive list of titles, is the latest company to do so with their release of 1775 Rebellion. The game, part of Academy’s Birth of America series, makes an excellent candidate for conversion with its straightforward rules and engaging play. The light war game allows you to pit the American colonists against the British in attempt to either forge a new nation or crush the rebellion. The iOS version reviewed was extremely reminiscent of the board game, down to the great cover art. The slanted map of the thirteen colonies begins with a smattering of colonial and empire troops spread across the board. Instead of blocks, sprites represent troops with numbers attached to show unit strength. The cards used in the game are identical to the board game version and can be enlarged in order to read the text included. It’s not the most beautiful game you’ll play, but the graphics are clear enough that game play is not affected. You control the colony if you own every area within it, which allows you to place reinforcements in its cities. Four factions can be controlled during the game. For the Americans, there are blue colonials and white Patriots, while the British have red regulars and yellow Loyalists. You can control one or both sides against the AI or a live opponent by passing the device to play. Setting up a free account through Hexwar allows you to play multiplayer online. While most pieces have a static starting position, each faction will place four troops in any owed area prior to the first round, which is great for tinkering with different strategies to keep the game fresh. You get a hand of three cards, most of which state how many armies can be moved, and how far they can move, during your turn. A handful of other cards have special events like the British converting colonists to their side thanks to Benedict Arnold or Marshal Rochambeau bringing French to help the Patriot cause. Additionally, there is one special truce card in each faction’s deck. This card allows troop movement, but it also determines the end of the game. After the third round, whenever one side has played both its truce cards, the game will end. Your goal to win is to own the most colonies by that time. There are plenty of tactical options with card choice and movement options. You control a colony if each area within it is either neutral or controlled by your troops. For Rhode Island, that means controlling just one area, but control for New York means owning seven areas. This is important because reinforcements can only be placed in cities within colonies you control. The British start with a three to two advantage, but the Americans have a strong starting position in New England. The board game had incredible balance between competitors, and that certainly carries over here. Unless you play against easy AI, you must play competently to beat the computer. Your round comprises of placing reinforcements, playing cards, moving troops, and then battling. You’ll find it hard to do this at times as clicking areas isn’t as fluid as it should be. Troop units must be clicked to reinforce and move. You may find yourself hitting the area a few times until you find that sweet spot, but luckily you can zoom in to increase the target area. It’s a little cumbersome at first, but it does work better the more you get used to the interface. Moving into an opponent’s area triggers a battle, and multiple battles can occur each turn. Battles begin when an army enters the area controlled by an opposing army. Every faction has unique dice for fighting. British and French dice have bullseye and blank sides. Each bullseye is a hit, and the opponent must eliminate one of their units. A blank side allows you to withdraw your unit to an adjacent, friendly area. All other factions add another symbol to their die, that of a man running. This means that unit has fled the field. These units are not eliminated. Rather, they have fled off the map to fight another day and return during the next reinforcement phase. This may seem like a disadvantage until you realize those six fled American colonists return in the next round along with the normal reinforcements. This greatly reflects the actual fleeing to fight later that often occurred during the American Revolution. This attention to detail gives each faction a distinct personality. The British red regulars are deadly accurate and will not flee the field, nor do their French counterparts. Colonists and British recruited Hessians are also accurate but may flee. Loyalists and Patriots, which serve as militia, are just as likely to flee as they are to be hit. Finally, either side can recruit Natives to their cause by marching troops into Native held areas. Natives are poor fighters, though, and will return as neutral forces should all their allies fall in battle. Each factions’ dice are unique, with some having the ability to run away to fight another day. The game is as much about positioning your troops, knowing when to withdraw, and using your reinforcements as it is about engaging in combat. Planning is rewarded as setting yourself up for key battles goes a long way in determining a winner, especially when you notice truce cards being played. It may not be a true war simulation, but there’s a nice amount of depth to this game. Lighter war games make excellent ports on mobile devices thanks to their accessibility. 1775 Rebellion is no exception. The interface could certainly be better, and it’s not a graphical masterpiece. Still, there’s a very enjoyable game here that’s worth picking up. It doesn’t take long to learn while its slick battle system and depth of strategies will keep it in your library for some time. 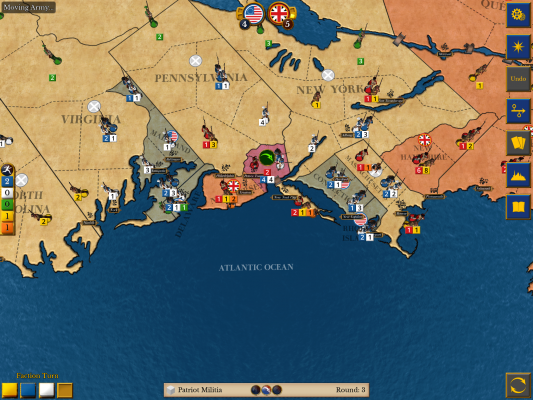 1775 Rebellion successfully takes the fun of the original board game title and ports it on to iPad and Android. The game isn't the prettiest one you'll play, but a competitive AI and incredible balance will keep this in your regular rotation.